In the 1980’s and early 90’s many workers were wrongly advised to transfer from a guaranteed final salary work pension into a private personal pension with an insurance company. As a result of this people found that they have been much worse off compared to their former work mates who stayed with the company scheme. Their original pension was ‘gold plated’ and had a lot of benefits which the private pension could never hope to match. Notably a lot of mineworkers and steelworkers were advised to transfer from their respective work pension schemes in the late 1980s after being made redundant. During the 1990s, an industry-wide review was carried out on the miss-selling of pensions and as a result a great many workers were either reinstated into their work pension or received redress or compensation. If this applies to you then you will already have been compensated and we will be unable to assist you in recovering any further compensation. However, for many workers, their pensions for one reason or another were not reviewed and they did not receive compensation. As a result they have suffered average losses of £60,000. Did you transfer your pension to any of the following pension providers? If you were advised by an agent of any of these companies please call us. Were you advised by an Independent Financial Adviser? In many cases IFAs are no longer in business. Even if they are not in business we should still be able to claim if we can establish the relevant insurer at the time. Please call us if you were advised to transfer by an Independent financial advisor. Were you advised by any of the following IFAs? There many hundreds of IFAs involved, these are just a few of them. 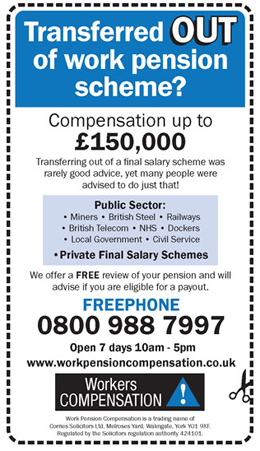 Please call us if you were advised by an IFA to leave your final salary work pension. Our team of pension specialists are here to help you with your claim. Mr D, a former miner from Barnsley, was made redundant in the late 1980s. After the pits closed he was encouraged by an agent of the Prudential to transfer his Mineworkers Pension Scheme to them. We were able to show that this wasbad advice. The Prudential eventually accepted this and agreed settlement of £110,000. Mr A from SOUTH HIENDLEY was advised in 1990 to transfer £8000 from his mineworkers pension to Norwich Union. He was advised by an independent financial advisers Goodare Owen & Co who are no longer in business . We traced there insurer who took responsibility for the bad advice and paid compensation of £67,000. Mr P of BARNSLEY was advised in 1989 by an agent of Abbey life to transfer £9300 from his mineworkers pension. He was wrongly advised and Abbey Life paid compensation of £100,359. Mr H of HEMINGFIELD was advised in 1990 by an agent of the Prudential to transfer £1900 from the mineworkers pension scheme to them . The Prudential accepted this was poor advice and paid compensation of £49000. Mr J of GREAT HOUGHTON was advised in 1991 by an agent of Sun Life to transfer £25k from his mineworkers pension scheme to them . We were able to show this was bad advice and obtained compensation of £135,000. Mr S of ROYSTON transferred £8500 in 1990 to Scottish Equitable on the advice of an financial advisers , Wentworth Life & Pensions. Even though the IFA was no longer in business, we were able to put in a claim and won compensation of £48000.